Custom-made stream sampler, 30” long, for unit-dose sampling, bulk sampling, or simultaneous unit-dose and bulk sampling while discharging the material. Up to ten unit-dose samples may be obtained at each sampling time point. Samples may be collected directly into empty gelatin capsules, thus eliminating the need to transfer the samples to vials. 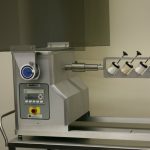 Or, the samples may be collected into cavities on the sample collecting disc, and then compacted into tablets using the manual tablet compression machine available from GlobePharma. The disc that holds the capsules and/or the sample bottle is made of 316 SS or Delrin, and is interchangeable with other discs for different size capsules/bottles. The disc that has the cavities for sample collection is made of tool steel and different discs are available for different size samples. Easy disassembling and cleaning.